The easy-to-use TheraSense test strips allow people with diabetes to take a blood sample from multiple sites including their fingertips, forearm, upper arm, thigh, calf and fleshy part of the hand, eliminating virtually all the pain of testing. Dual target areas on both sides of the strip allows for easy filling from the right or left hand side. 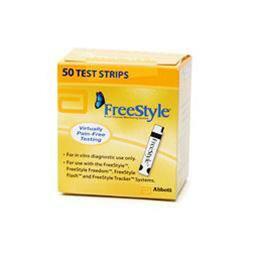 The package of FreeStyle Test Strips comes in 1 vial of 50 test strips.